Need a Paycheck While in School? Learn Skills Employers NEED. Earn a Paycheck while you do it. Are you worried about being able to afford continuing your education? We developed a program that allows you to earn a paycheck while you learn the skills to launch a tech career. Imagine being able to pay your bills while going to school, so you can earn a bigger paycheck in the future. 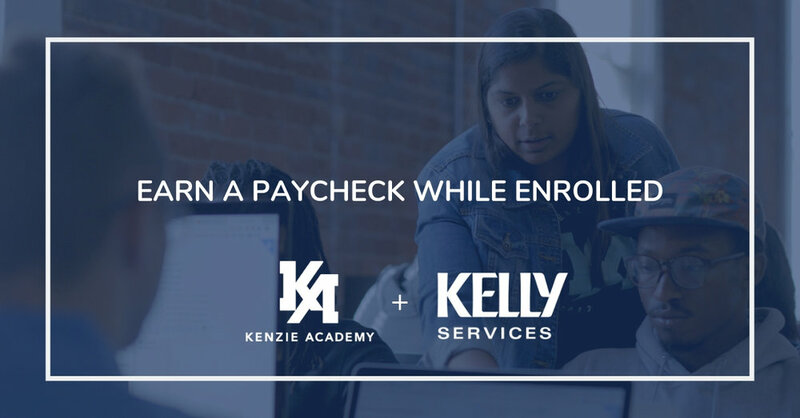 Through the program, Kelly Services provides remote, part-time jobs to Kenzie students that work with their class schedule. Kelly is offering part-time, remote roles that give you the flexibility to choose your own hours and work from home. You could earn $13/hour. Get matched with roles that are real resume builders, and develop relationships with employers before graduation. You will get paid for training and be supplied with a computer and headset. You must be an enrolled Kenzie student for either a current or future cohort to take part in the program. Our Earn and Learn program is already receiving national recognition from Business Wire and Inside Indiana Business.